MANILA, Philippines – FPG Insurance, the major player in the general insurance industry, previously recognized its top brokers for 2018 at the annual broker’s night held recently at the Discovery Primea in Makati City. 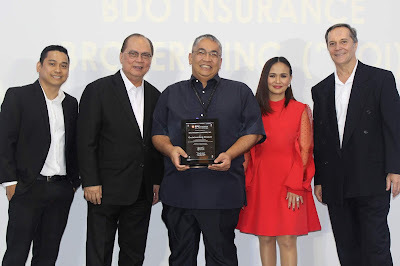 Member of the SM Group and BDO subsidiary, BDO Insurance Brokers, Inc. (BDOI), emerged as the Top Broker for 2018. BDOI has consistently been FPG’s top broker for three years in a row now with its General Manager Tracy Tan at the helm of its business. Global brokerage leaders and two of the largest in country, AON Philippines and Marsh Philippines, are also among the top brokers for 2018 ranking second and third respectively. Other awardees who made the list include Lacson & Lacson Insurance Brokers, Inc., Chinabank Insurance Brokers, Inc., Unicon Insurance Brokers Corporation, Gotuaco del Rosario Insurance Brokers, Inc., Bonifacio Insurance Brokers Corporation, Trinity Insurance Brokers, Inc., Eastwest Insurance Brokerage, Inc., Philpacific Insurance Brokers and Managers, and Howden Insurance & Reinsurance Brokers Philippines, Inc.
“FPG Insurance has reached great heights through the invaluable contribution of our esteemed brokers, and we continue to become the leading general insurance provider of the biggest names in the corporate industry. We are very excited with what 2019 has in store and together, our industry leadership can provide the best customer service our mutual clients expect from us,” said FPG Insurance President and CEO Ramon Dimacali. The occasion was also a back-to-back celebration as FPG Insurance Regional Managing Director Steve Blasina announced the new role for Corporate Business Group Senior Vice President Beth Villamil as the company’s new Regional Brokers Relations Head. “We are very privileged to have these reputable brokers in the insurance industry as our partners in providing risk management solutions to the most important businesses out there. FPG Insurance remains committed in providing the product of safety and peace of mind to everyone,” said Villamil. FPG Insurance offers a comprehensive suite of corporate insurance products from motor fleet insurance, business travel, property, marine, casualty, financial lines, health and accident, surety bonds, and engineering.